A comprehensive range of 19 inch racks, cabinets and frames suitable for a variety of application and equipment requirements. When designing a rack system, one of the most important factors to take into account, is whether the racks you select will fit the servers you need. 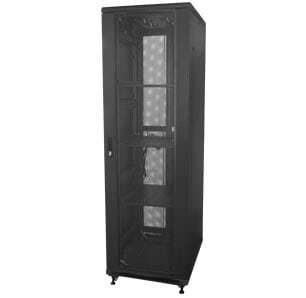 The Ausrack Plus range of cabinets are designed to SSI specifications for Computer Server Cabinets & Enclosures. This is an independent specification that has been endorsed by all the major server and network equipment brands. 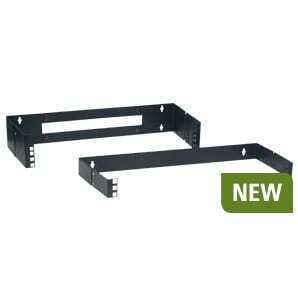 A rack’s mounting fixture consists of two parallel metal strips (referred to as “rails”) standing vertically. The rails are separated by a gap of 17.72 inches (450 mm), and are a minimum of 0.657″ (16.7mm) wide giving an overall rack width of 19 inches (482.6 mm). The rails have holes in them at regular intervals, with both rails matching, so that each hole is part of a horizontal pair with a centre-to-centre distance of 18.3 inches (465 mm). The holes in the rails are arranged vertically in repeating sets of three, with centre-to-centre separations of 0.5 inch (12.7 mm), 0.625 inch (15.875 mm), 0.625 inch (15.875 mm). The hole pattern thus repeats every 1.75 inches (44.45 mm). Racks are divided into regions, 1.75 inches in height, within which there are three complete hole pairs in a vertically symmetric pattern, the holes being centred 0.25 inch (6.4 mm), 0.875 inch (22.2 mm), and 1.5 inch (38.1 mm) from the top or bottom of the region. 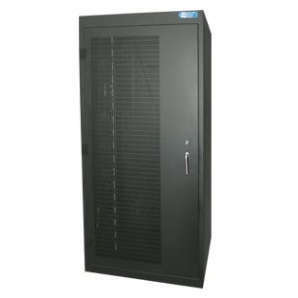 Such a region is commonly known as an “RU” or “U”, for rack unit or unit respectively. The Ausrack system uses plain square mounting holes as these allow boltless mounting of some equipment, and can be adapted for use with bolts by the use of cage nuts. Rails are made of steel of 2 mm thickness for strength. All Ausrack Plus, TxD and Floor onyX range include 4 rails as standard, 2 at the front and two at the rear. For an easy to read summary of this information, please see the pdf on rack specifications. For more information on the type of rack available, see our product range above.